Few presidents are as respected as Abraham Lincoln. We all know some basic facts about the man who would have been 207 this year: he was tall, bearded, a lawyer and a politician; he famously debated Stephen A. Douglas, most notably about slavery; he was president during the Civil War and issued the Emancipation Proclamation, which ended legal slavery; and he was assassinated at the theater. But there is so much more to this important historical figure, and you can discover it in Special Collections. For a rare look at Lincoln and the Civil War, explore our newly described American Civil War Documents, Manuscripts, Letters and Diaries and Grand Army of the Republic Collections. 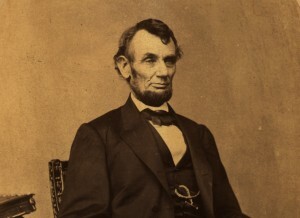 You'll find fascinating documents that paint a fuller picture of our 16th president, including an 1841 handwritten deed selling property from Lincoln's parents to Lincoln, early printings of speeches he gave before he became president, and much about how citizens mourned his death. The collection also gives fresh insight into the Civil War and slavery, especially through the letters and diaries of Illinois soldiers in the war. Behind the Scenes: First published in 1868 and now available in several editions, the subtitles say it all, "Thirty Years A Slave, and Four Years in the White House," by Elizabeth Keckley, "Formerly a slave, but more recently modiste, and friend to Mrs. Abraham Lincoln." Abraham Lincoln's Visit to Evanston in 1860: This short account written by the head of the Evanston Historical Society in 1914 draws on interviews with participants in Evanston's one-night hosting of the soon-to-be president. What do you most admire about Abraham Lincoln?